A much-branched evergreen shrub or tree up to 30 m., with a densely leafy rounded crown and pendent branches. Bark fairly smooth, pale to dark greyish brown. Young shoots and petioles yellowish-brown tomentose or pubescent at first, later glabrescent. Petioles 3–7 mm. long; leaf-blade ovate, ovate-rhombic, elliptic-ovate or lanceolate, (2–)5–12(–17) cm. long, (1–)2–6(–9) cm. wide, acute, subacute or obtuse, often slightly acuminate, somewhat asymmetrically rounded-cuneate, shallowly and remotely crenate-dentate to subentire, thinly to moderately coriaceous, shiny above, lateral nerves 6(–8) pairs, looped within the margin, tertiary nerves reticulate, those nearest the midrib ± perpendicular to it and subparallel for a short distance, slightly prominent above, more so beneath, sparingly yellowish-pubescent above and more evenly so beneath, and sometimes more densely so on the midrib beneath, or else quite glabrous above and beneath, dark green, drying brownish. Stipules triangular-ovate, 1.3–1.5 mm. long, sparingly to densely yellowish-pubescent, soon deciduous. Flowers axillary, the males glomerulate-fasciculate with (2–)4–12(–15) flowers per fascicle, produced after the females, the females usually solitary. Male flowers:pedicels 3–6(–8) mm. long, evenly to densely yellowish-pubescent; sepals 4, suborbicular-ovate, 2 mm. long, 2 mm. wide, evenly to densely yellowish-pubescent without, sparingly to evenly pilose within, ciliate, yellowish green, yellow or creamy white, fragrant; stamens 4, 2–3 mm. long, anthers 1 mm. long; disc crenulate to subentire, plicate, the folds protruding a little between the stamens, smooth, with a small cylindric central projection, glabrous. Female flowers:pedicels 1–2 mm. long, extending to 0.5–1(–2) cm. in fruit; sepals as in the ♂; disc shallowly cupular, subentire, glabrous; ovary 2-locular, subglobose, 2 mm. long, 2.5 mm. wide, densely fulvous-tomentose; styles 2, 1–1.5 mm. long, united at the base, reflexed, persistent; stigmas linear. Male flowers:pedicels 3–6(–8) mm. long, evenly to densely yellowish-pubescent; sepals 4, suborbicular-ovate, 2 mm. long, 2 mm. wide, evenly to densely yellowish-pubescent without, sparingly to evenly pilose within, ciliate, yellowish green, yellow or creamy white, fragrant; stamens 4, 2–3 mm. long, anthers 1 mm. long; disc crenulate to subentire, plicate, the folds protruding a little between the stamens, smooth, with a small cylindric central projection, glabrous. Female flowers:pedicels 1–2 mm. long, extending to 0.5–1(–2) cm. in fruit; sepals as in the ♂; disc shallowly cupular, subentire, glabrous; ovary 2-locular, subglobose, 2 mm. long, 2.5 mm. wide, densely fulvous-tomentose; styles 2, 1–1.5 mm. long, united at the base, reflexed, persistent; stigmas linear. Fruit obovoid-subglobose, usually shallowly bilobed, 1–1.5 cm. long, 1–1.5 cm. diameter, smooth, yellowish to golden-brown tomentose. Seeds compressed-ovoid, up to 1 cm. long, mottled brownish. 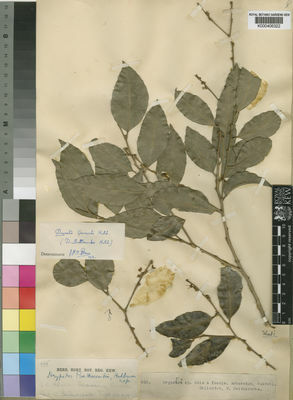 A large evergreen ramiflorous shrub to c. 3 m high, or tree to 30 m; bole slightly fluted to sharply buttressed up to c. 1 m, (15)23(38) cm d.b.h., unbranched to 10 m, then much branched; branches in one plane from c. 5 m forming a narrow dense crown. Bark smooth, or flaking in oblong or circular patches, pale grey or brown. Young shoots and petioles densely yellowish-tomentose to evenly or sparingly pubescent or subglabrous. Stipules c. 1 × 0.5 mm, triangular, soon falling. Leaves 2–14(17) × 1–7(9) cm, obliquely ovate to rhombic-elliptic or lanceolate, acute to subacute or obtuse, acuminate or not at the apex, weakly to strongly asymmetrically rounded or cuneate at the base, usually shallowly crenate-serrate to subentire on the margins; blades thinly coriaceous, often yellowish-pubescent along the midrib above and beneath and otherwise glabrous, or else completely glabrous, dark green and glossy on the upper surface, paler beneath, those of the upper crown usually brighter yellow-green; lateral nerves in 5–9 pairs, looped well within the margin, and often with a second series of loops towards the margin, tertiary nerves reticulate, parallel near the midrib, scarcely to fairly prominent above, usually prominent beneath. Flowers axillary, male flowers in few-flowered glomerules, the females solitary. Female flowers: pedicels 1–2 mm long, extending to 1(2) cm in fruit; sepals as in the male; disk c. 1.3 mm in diameter, shallowly cupular, subentire, glabrous; ovary 2-locular, 1.5 × 2 mm, subglobose, densely sericeous-tomentose; styles 2, free, reflexed,1–1.5 mm long, persistent; stigmas ± linear. Male flowers: pedicels 3–4 mm long, yellowish-pubescent; sepals 4, 3 × 3 mm, suborbicular, densely yellowish-pubescent without, sparingly pubescent within, creamy-yellow; stamens 4, 3 mm long, anthers 1 mm long; disk c. 2 mm in diameter, 4-lobed, the lobes somewhat crenulate, protruding a little between the stamens, smooth, pubescent, with a shallow central boss. Male flowers: pedicels 3–4 mm long, yellowish-pubescent; sepals 4, 3 × 3 mm, suborbicular, densely yellowish-pubescent without, sparingly pubescent within, creamy-yellow; stamens 4, 3 mm long, anthers 1 mm long; disk c. 2 mm in diameter, 4-lobed, the lobes somewhat crenulate, protruding a little between the stamens, smooth, pubescent, with a shallow central boss. Female flowers: pedicels 1–2 mm long, extending to 1(2) cm in fruit; sepals as in the male; disk c. 1.3 mm in diameter, shallowly cupular, subentire, glabrous; ovary 2-locular, 1.5 × 2 mm, subglobose, densely sericeous-tomentose; styles 2, free, reflexed,1–1.5 mm long, persistent; stigmas ± linear. Fruit 1–1.3 × 1.3–1.7 cm, obovoid-subglobose, usually shallowly bilobed, evenly tomentose, apple-green to grey-green when fresh, yellowish-brown when dried. Seeds c. 1 mm long, compressed-ovoid, brownish, streaked whitish. Drypetes gerrardii var. angustifolia Radcl.-Sm. Drypetes gerrardii var. grandifolia Radcl.-Sm. Drypetes gerrardii var. tomentosa Radcl.-Sm. Troupin, Fl. Pl. Lign. Rwanda: 257, t. 89. 3 (1982). F. White, Forest Flora of Northern Rhodesia p. 197 (1962). Hutch. in Fl. Cap. 5(2): 405 (1920).